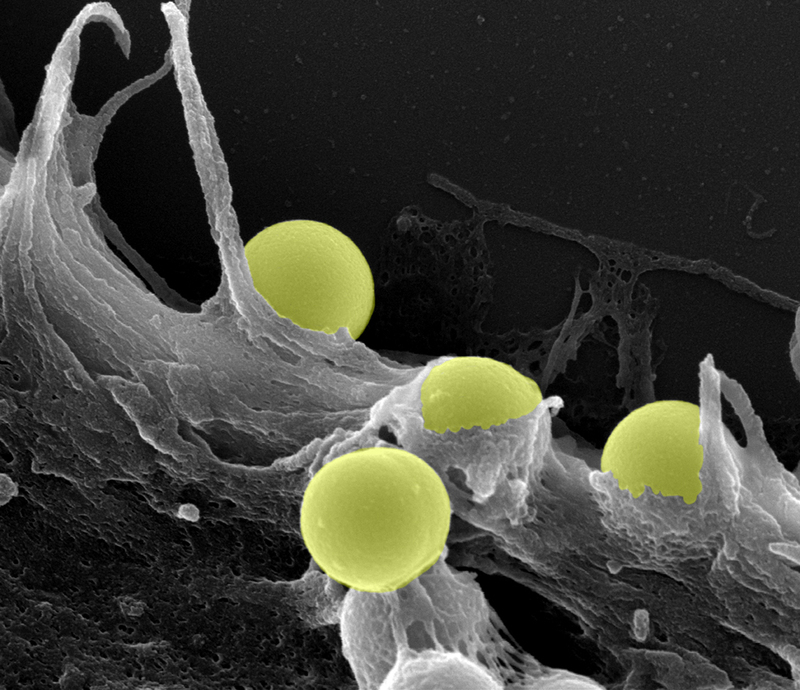 Caption: Scanning electron micrograph of silica beads (yellow) on the surface of a human fibroblast cell. Many of the most exciting frontiers in biomedical research sound like the stuff of science fiction, but here’s some work that even looks like it’s straight from the set of Star Trek! This scanning electron micrograph captures the pivotal moment when nanospheres—a futuristic approach to drug delivery—are swallowed up by a human fibroblast cell. The NIH-funded researchers who took this stunning photograph, one of the winners in the Federation of American Societies for Experimental Biology’s 2013 BioArt Competition, are using tiny silica beads (yellow in the image above) to investigate how drug-laden nanoparticles are transported into cells. They are focusing on fibroblasts because although they produce vital molecules that give healthy tissue its structure and strength, they also surround and nourish many types of cancer. By taking advantage of nanotechnology’s precision to deliver chemotherapy drugs to only those fibroblasts growing near cancer cells, the Houston Methodist Research Institute researchers hope someday to be able to attack cancer far more effectively—and with fewer harmful side effects—than is possible with current methods. BioArt 2013 Exhibit. The public can view an exhibit of the winning art at the NIH Visitor Center. Located in Bethesda, MD, the Center is open from 8:30 a.m.–4:30 p.m. M–F.